Here’s Apple Watch Series 3 Vs Apple Watch Series 2 Vs Apple Watch Series 1 specs comparison side-by-side in detail. Apple Watch Series 3 is now official, which means it’s time to take a look at the product line in a little more depth which should help you decide which of Apple’s watchOS-powered watches is for you. It’s probably fair to suggest that most people tuned in to Apple’s media event to see exactly what was going to be brought to the table with the 2017 iPhone lineup. Most of Apple’s announcements were exactly as expected, including the introduction of Apple Watch Series 3, which was an announcement that would definitely have delighted the wearable crowd. The introduction of Apple Watch Series 3 means that consumers now have three models to choose from in Series 1, Series 3 with GPS, and Series 3 with GPS + Celluar. The Cupertino-based company has officially taken Series 2 out of the picture, but it’s still worth considering what the hardware brought to the table. The Series 1 hardware will ship with Apple’s S1P dual-core processor, whereas Series 2, as mentioned earlier, has been discontinued, but more on that latter. Series 3 models ship with a faster dual-core S3 chip. Both of those Series 3 models also offer built-in GPS and GLONASS, which is unique to this particular Series. From a similarity perspective, all of the aforementioned models offer a heart rate sensor, water resistance, or splash resistance where Series 1 is concerned, sensors like accelerometer, ambient light sensor, and gyroscope and a certain amount of internal storage with Series 1 coming with 8GB and Series 3 offering up to 16GB for those who choose the GPS + Cellular model. The real difference here is that Series 1 and Series 2 offered Wi-Fi connectivity and Bluetooth 4.2, with Series 3 really taking it to the next level with LTE and UMTS for those who opt for the Cellular option. As for Series 3 Vs Series 2, Series 3 GPS model is really an almost like-for-like replacement for Series 2 but with the addition of a second-generation OLED Retina display, and other miscellaneous features like Siri speaks, and the second-generation Apple W2 chip. If you are upgrading from an original Apple Watch, or Series 2, or simply don’t currently own one but are planning on an investment, this comparison should help making the right decision. 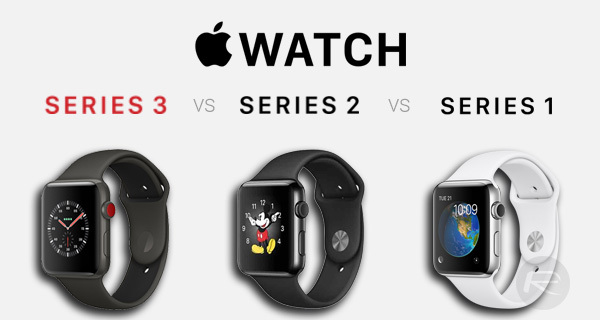 The title says series 1 vs series 2 vs series 3, but the screenshot is series 1 vs series 3 vs series 3 LTE. Series 2 and series 3 is same exact watch just different name. Do your series 2 have LTE and Siri? Not talking about the series 3 with LTE. was talking about the normal series 3 GPS. My Apple Watch 2 does have GPS and Siri out the box. My understanding is that series 3 has Siri speaking and I don’t believe series 2 has that. The series 2 uses the S2 chipset, whereas the series 3 uses the W2 chipset. I thought I heard in the presentation that the series 3 now includes something that allows it to measure the steps you take if you are a stair-stepper (basically an altimeter I gather). So yeah, I would have liked to have seen this article actually do what its title implies and compare the series 2 and 3 so I could determine if I should upgrade or not. Thanks for nothing. I wanted a Series 1 vs 2 vs 3 comparison, not a screenshot of Apple’s website that only has Series 1 vs 3.